Home homeschool "You Shall Not Pass" Toilet Paper Sign! "You Shall Not Pass" Toilet Paper Sign! I'm sure I'm not the only one who has struggled with my child over how much toilet paper they should take when they use the potty. Sometimes I go in there and my 3 year old will have a toilet FULL of paper...most of the roll gone in one sitting. =/ That's when we created this sign. "You shall not PASS!" It gives her a visual limit of paper she's allowed to use. She unrolls the paper until it reaches the sign and that's how much she takes. The paper tears from the back of the roll and gives her 5 double-quilted sheets to work with. More than enough for her but less than 100 feet. Haha! Give it a try with your kids! lol to cute maybe it will work for the kids at work!!! i am forever seeing a whole roll of toilet paper in the toilet!!! We tell our toddler she can use 2 squares and she is good about obeying that. She loves to unroll the roll though and try to roll it back up. We haven't figured out how to curb that one. Just pinned this to my Pinterest board,and shared on Facebook,and Twitter.This is a fabulous idea. 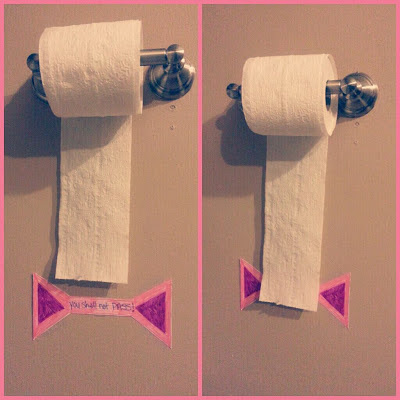 I love seeing that you even put your toilet paper on "the right way" ;) Love this idea and am going to try it now! It's on the "wrong way" *wink* but I'll switch it around for this sign to work and curb wastage in this house by my toddlers. Dont understand how the toilet paper hanging one way or the other makes any difference to whether it comes in contact with the wall or not...or maybe just the one that is on wall in my house. But think this is a very clever idea indeed. This is an awesome idea because it is a visual reminder for children to learn how much is too much or at what amount is sufficient. I am sure it also helps with the amount of having to replenish the toilet paper. Thank you for sharing this really good idea!